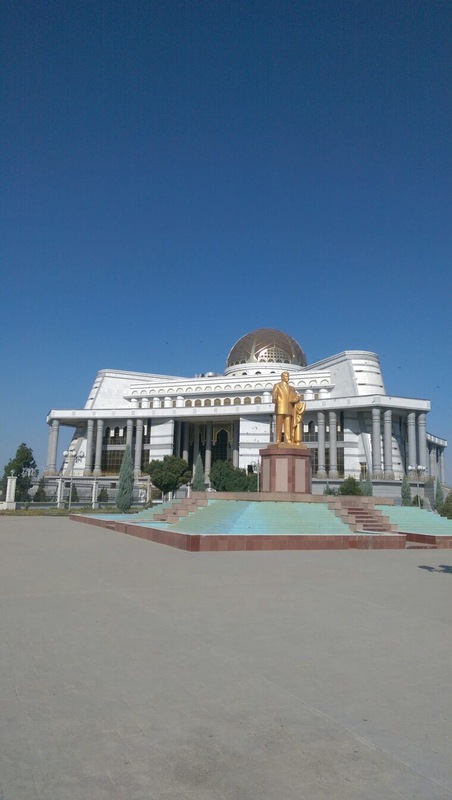 Turkmenistan – our four day dash across country no. 9!!! After all the hype and worry about getting our visa for Turkmenistan it felt slightly surreal crossing the border and finding ourselves on the edge of the Karakum desert. 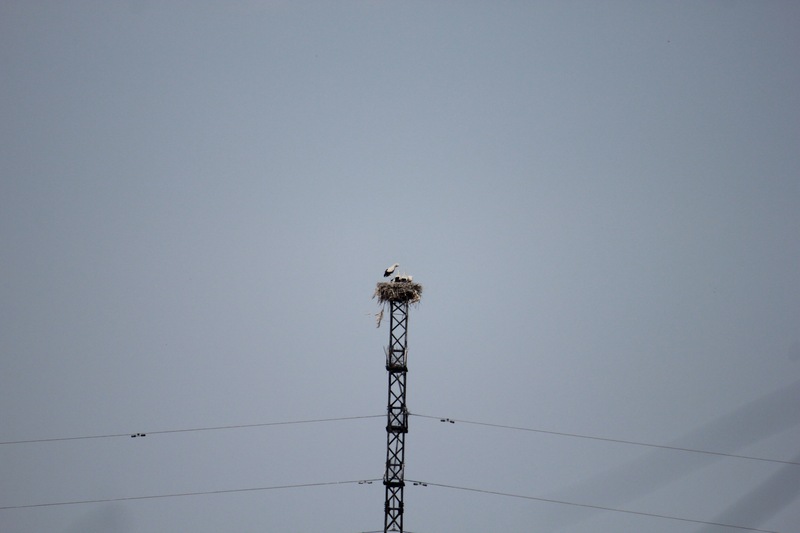 We were both very revealed to be taking this route rather than taking a flight or crossing the Caspian by boat. It took a while to convert our letter of invitation into a visa in our passport but having camped only 7km from the border the previous night we had plenty of time. 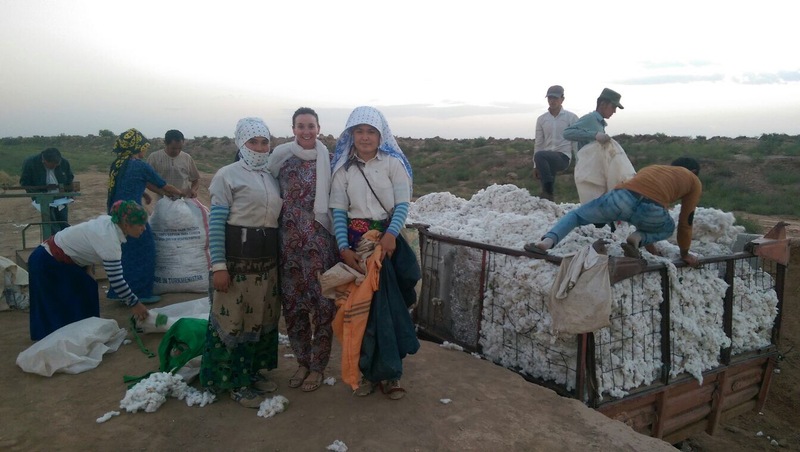 We made a beeline to the rail-side market in Turkmenabat where we changed $50 into Turkmen Manat and stocked up on water and food for the four day journey. 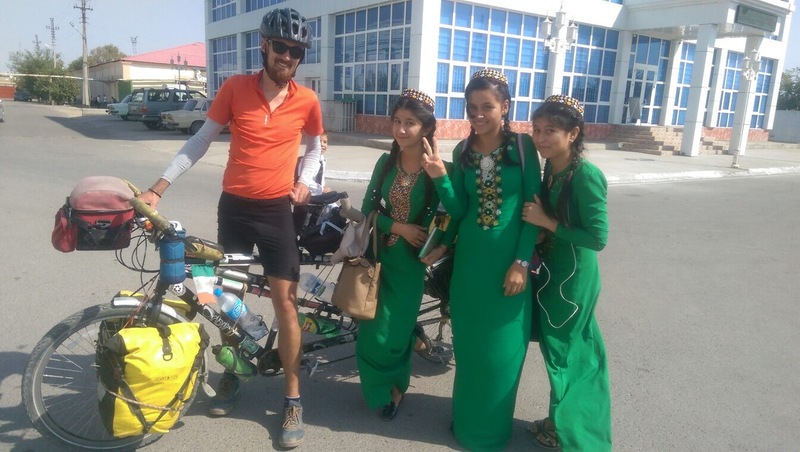 We had met a couple of cyclists on the road to Bukhara who had told us that there were cafes and restaurants every 40km so we didn’t bother carrying loads and loads of food. 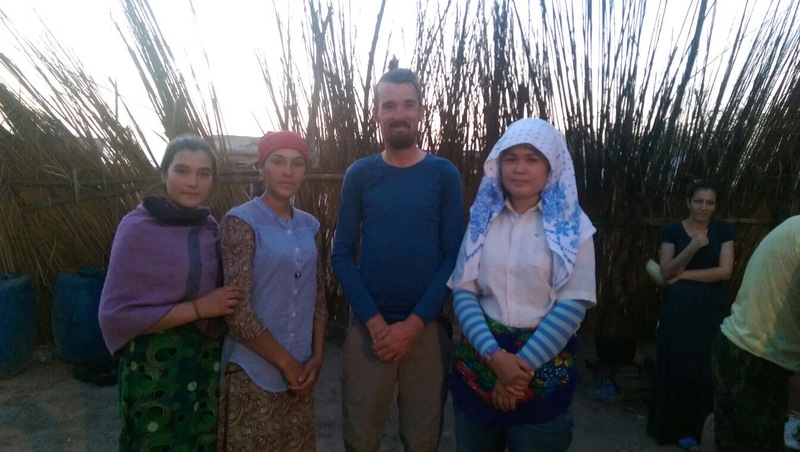 Our first impressions of the Turkmen people were that they are very beautiful! People are incredibly friendly but slightly more chilled than in Uzbekistan, possibly because they’re not too used to tourists. Women wear long elegant dresses which are more shapely than the tunic/trouser conbo found in the other Central Asian countries although a lot still wear a tied head scarf. We spotted lots of young people walking home from school – the boys wearing white starched shirts and black ties and the girls in long green dresses with colourful hats and decorative fronts. They all wore their hair in long plaits which we guess is part of the uniform. So we headed off into the desert. The road is very straight, flat and well maintained and that promised tailwind we had heard so much about was blowing us along nicely. At 6:30am we pulled off the road, snuck down into a sand dune and set up camp. Knowing it would be a hot day we get up at 5:45am and were able to get going by 7:30am. The wind helped a lot that morning and we zoomed along the road at 26km an hour. After stopping for a quick somsa and to stockup on water at a roadside cafe we get going again, but that tail wind has changed and it’s now not helping us quite so much. We also hit some small inclines and so our average speed dips to 22km/ph. We wanted to cover a lot of miles that day though, there was still a long way to go and we knew the road would be a lot worse for the last 100km to the border. Late in the afternoon we spot another cyclists in the distance. 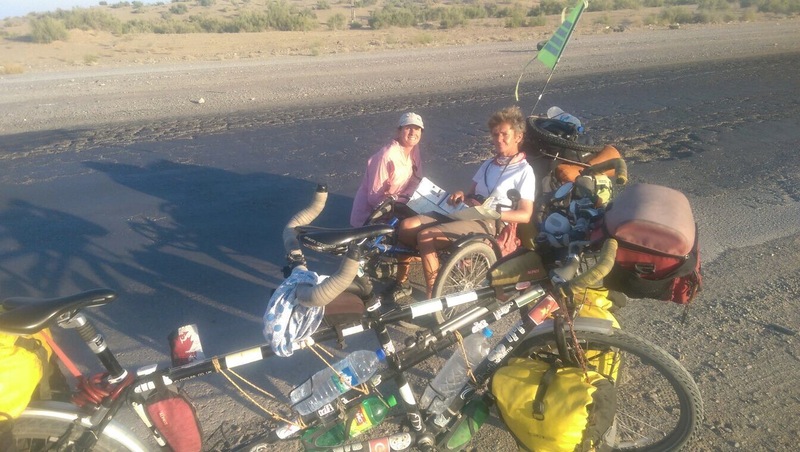 Annette had cycled all the way from Germany on her three wheel, reclined bicycle. We swapped news and tips before setting off again. Darkness was closing in but Annette had told us about a restaurant 20km up the road and convinced us it would be a great place to stay. Trusting her advice we managed another 70mins on the bike bringing our total distance up to 140km – the longest distance we have done so far on the trip! This extra toil was well worth it however and not only did we get a good meal at the restaurant but the owner offered us a shower and sleeping space in a spare room all for free. Can you imagine this happening in the UK?! The next day saw us reach the city of Mary which is close to the archaeological site of the ancient city of Merv. Merv, along with Demascus, was once one of the great cities of the Islamic world, an important centre of learning and an important city along the Silk Rd. We didn’t have time to visit the site however. We would also be missing out on visiting the capital Ashgabat which would have been a considerable detour north for us. It was a shame as it’s famous for being one of the strangest places on earth. A ‘showcase city’ full of golden statues, marble buildings and manicured parks all built to the lavish tastes of the current president and previous ‘Turkmenbashi’. Cycling through Mary’s city centre did offer us a glimpse into this world of splendour however. There was a spectacular blue domed mosque with four matching minarets at each corner and a number of gold domed buildings, one of which had a fittingly ‘bling’ metal work exterior complete with a golden statue of Berdymukhamedov (current president) outside it. Paddy said it looked as if a handful of super yachts had just thrown up on the pavement which, I thought summed up the whole look pretty well. After Mary we carried on down the road completing another 100km day before turning off down a side track and camping in the sand dunes again. With two more days left on our visa and only 150km left to cover we were in pretty good shape. However, we knew the road would get much worse once we turned off south onto the smaller back road towards Saraghs and we also needed half a day to cross the border so we couldn’t relax too much. 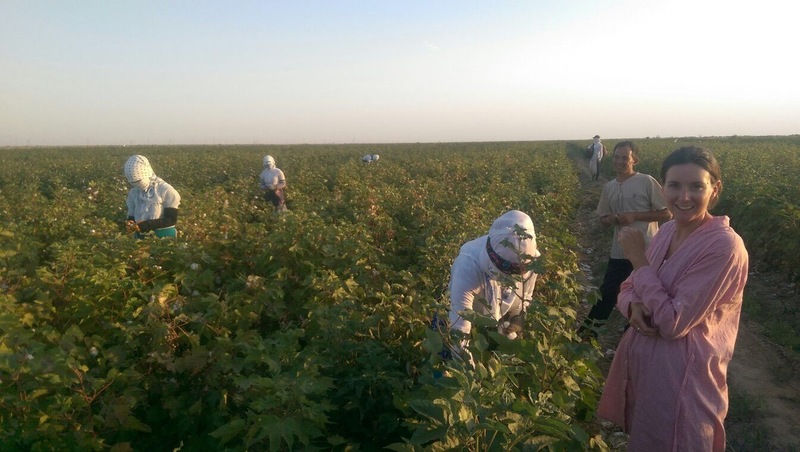 After 40km we turned off the main highway and started to follow the potholed gravel road south towards the border which took us through the fertile plains, lush cotton fields flanking the road on either side – these plants looked much healthier than the ones we were used to seeing Uzbekistan. It’s a slow bumpy afternoon and we manage 96km before stopping at a group of buildings to ask if we can pitch our tent nearby. The buildings turn out to be seasonal living quarters for a large group of cotton pickers who are still out picking in the huge field beyond. The owners welcome us and invite us to walk out into the fields to see the picking in action. Around 35 people, women mainly, are out in the field. Covered with white head scarfs to protect themselves from the beating sun they move through the plants plucking at the burst pods. The fields go on as far as the eye can see. At dusk we all traipse back to the buildings and each bag is weighed and then added to a metal cage. Everyone goes off to wag and change and we’re shown where we can put up our tent. In a makeshift outdoor kitchen surrounded by bamboo/fern walls, a huge plov is being prepared. We’re given a huge bowl and invited to eat with a group of women just as the sun disappears. They are a horrendous amount of mozzies and we both get attacked despite wearing log sleeves and lots of repellent. 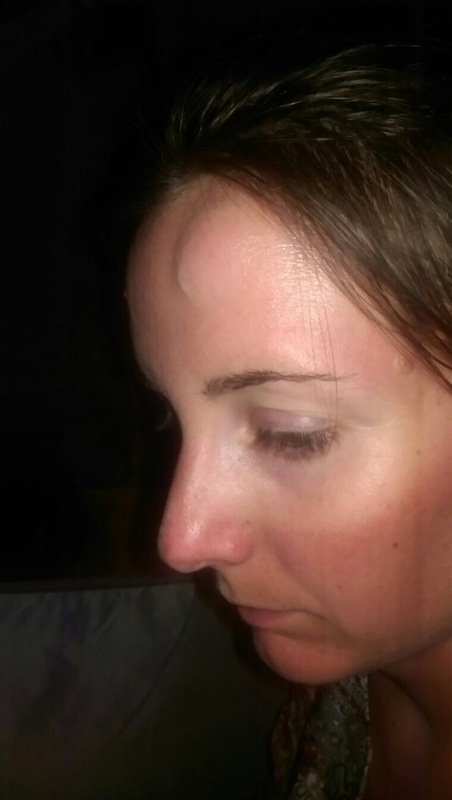 One particularly nasty one got me on my forehead and the sting swelled up into a huge lump! After dinner some very cool Asian drum and bass was blasted out and all the younger cotton pickers jumped up to pull some shapes. Everyone is really nice and we have a great time dancing and taking lots of pictures with them all. At 10.30pm we retire to our tent but the music continues to blast out for a good hour after we fall asleep. By 6.30am everyone is up and getting ready to get back into the field. We pack down too and after some cold plov get back on the bike to cycle the remaining 40km to the border. We leave Turkmenistan feeling sad that we only had 5 days here. The hospitality and the people have been amazing. 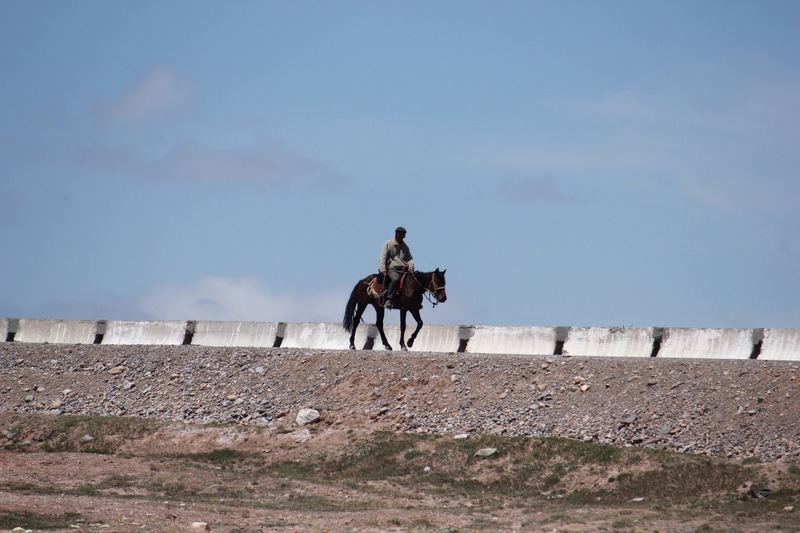 So it’s just under 2 weeks since we crossed the border into country number 6, Kyrgyzstan. 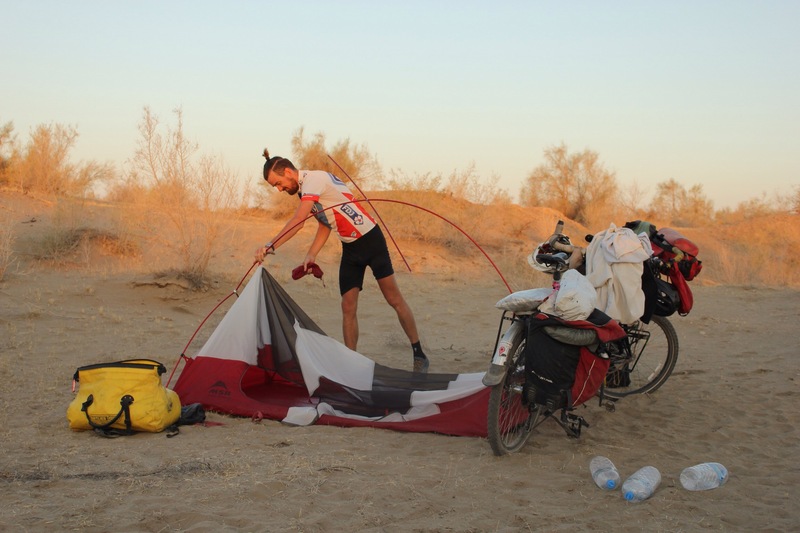 Updating the blog has been tricky as we’ve been doing a lot of cycling and camping. Neither of us knew much about this country before we arrived. 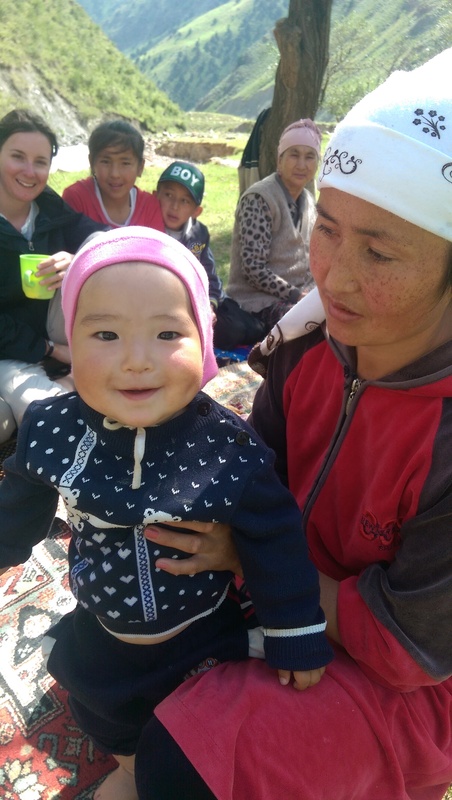 Sandwiched between Kazakhstan, Uzbekistan, Tajikistan and China it has a population of just 6 million; a dwarf in comparison to its neighbours. Our plan was to head up to the capital Bishkek where we would spend a good stretch organising our visas for the next stage and then loop back down towards Tajikistan. All in all, taking around 5 weeks. 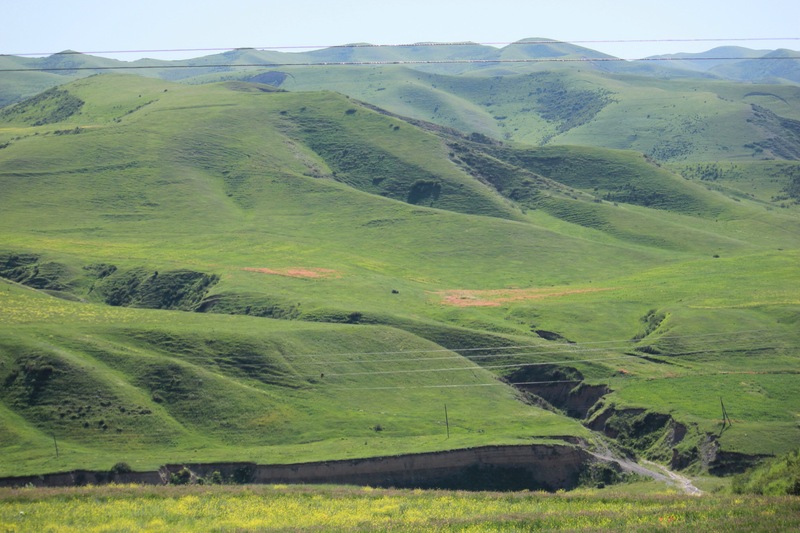 Formerly part of the Soviet Union until independance in 1991, little Kyrgyzstan is a relatively new country. 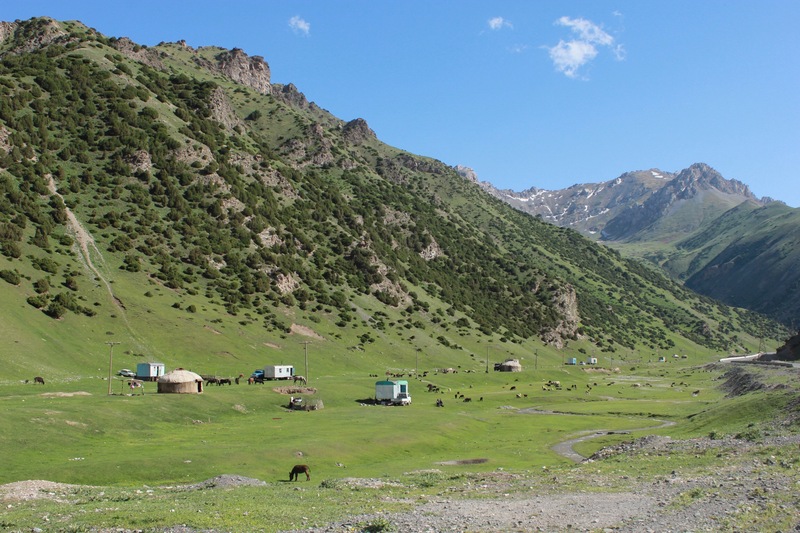 Naturally, almost everyone speaks Russian but the Kyrgyz language remains very strong, particularly in the southern part of the country where the people are more Persian looking and Islam is practiced more widely. It’s 4pm before we reach the first border town. There’s a strong headwind and just passed the town we see our road snaking up a very stiff gradient – neither of us fancy doing much climbing today. We stop just outside the town and contemplate where we can pitch up. A girl of around 14 rushes out of the first house shakes our hands and beckons us inside. We are fed bread, jam and tea and told we can pitch our tent in the garden. We spend the rest of the afternoon playing with the many local kids who like climbing the bike and using our tent as a den. Before bed a dinner of fried liver, dill risotto and a kind of homemade fudge is presented to us. 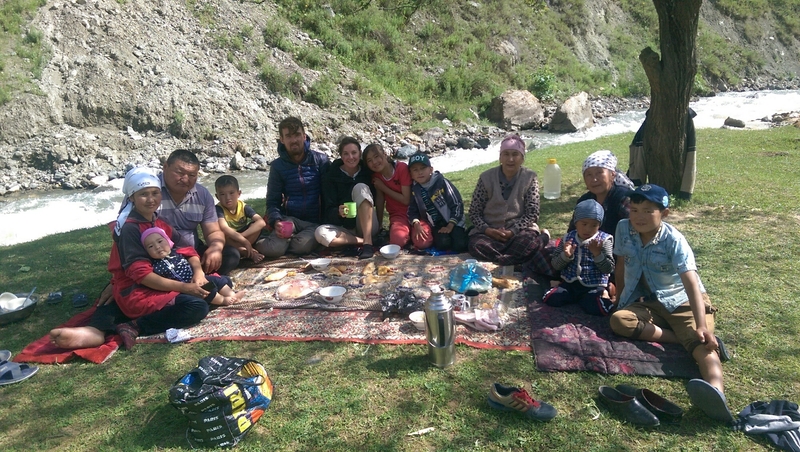 This is our first taste of Kyrgyz hospitality and we feel very humbled. The next morning we rise early and say our goodbyes to our hosts. The daughter requests we pay something towards the food. The small sum of 400 is suggested but we remind ourselves we don’t have any local currency. We readily hand over 5 USD instead which is accepted with thanks. 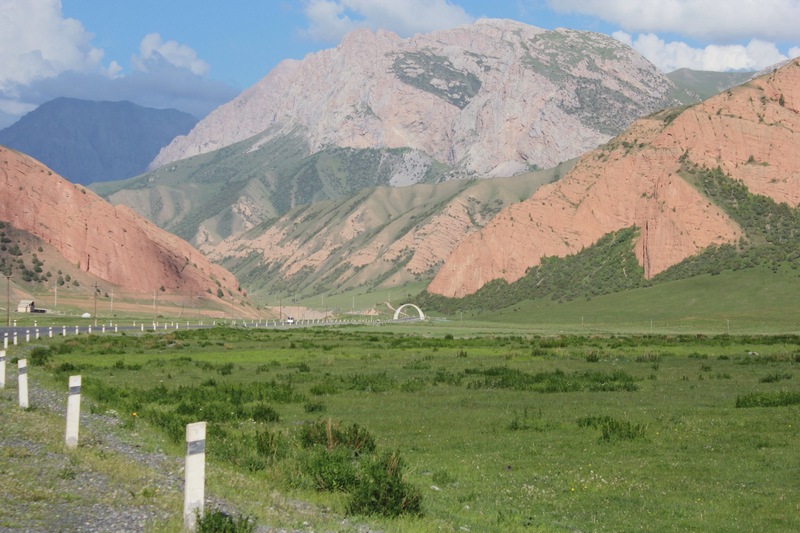 This first experience of Kyrgyz hospitality was tainted slightly after we reached the next town where we discovered that someone had stolen money from our bag during our stay in the house. It wasn’t a lot (the equivalent of around £40) but we felt sad it had happened after having had such a nice evening. 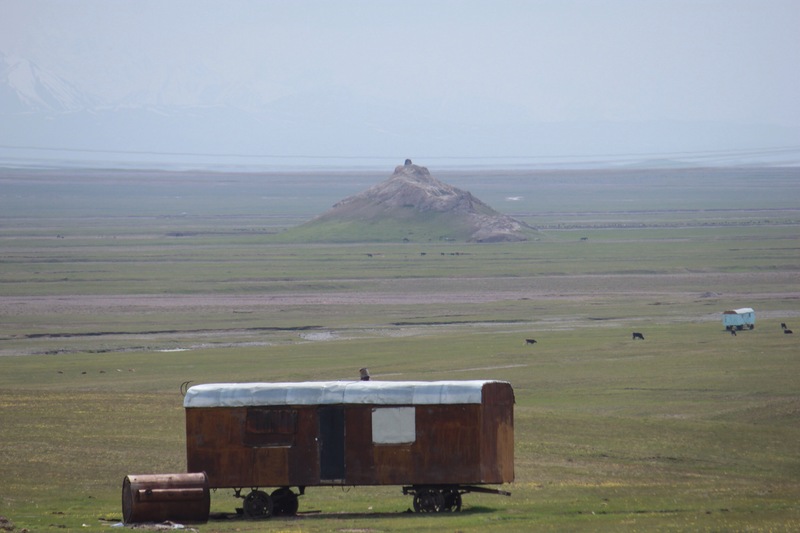 Our next destination was the town of Sary-tash roughly 75km away. From there we would cycle the remaining 175km East to the southern city of Osh where we would enjoy a well deserved rest day. There would be some big climbs involved and we soon discover the blissfully easy gradients of Chinese roads are a thing of the past. 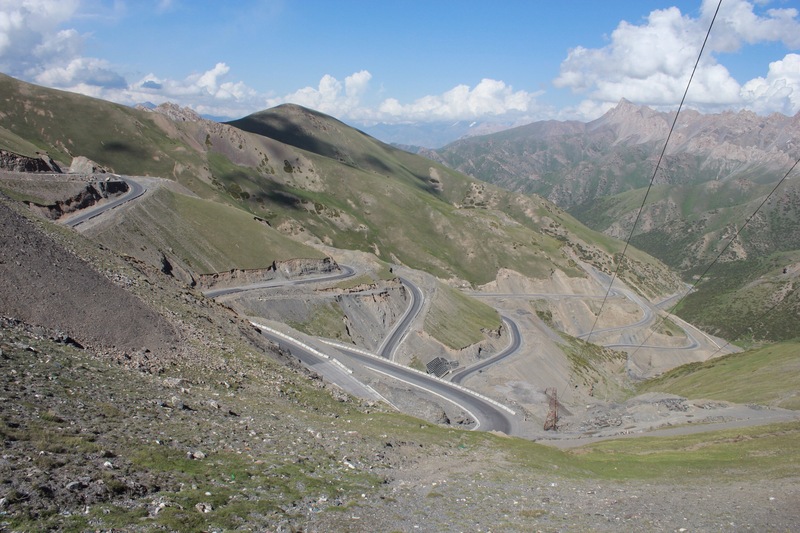 Russian/Kyrgyz road builders love a good gradient. There are often signs telling you how steep the next section will be, but as Paddy and I soon discovered, these hold little relation to the true gradient. The signs almost always read either 12% or 8% and we’ve now learnt that their purpose is to simply let you know a climb is coming… a REALLY steep climb! 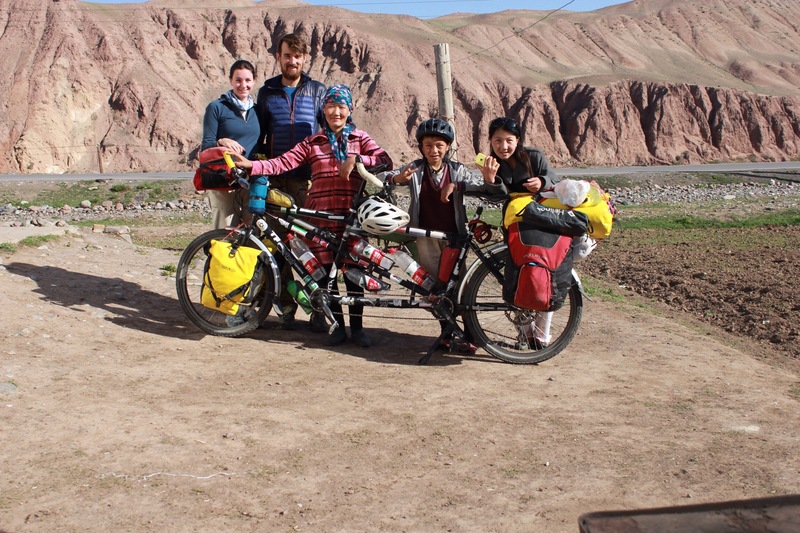 I was convinced that we wouldn’t find scenery and countryside nicer than we saw in China but that was before I cycled in Kyrgyzstan. 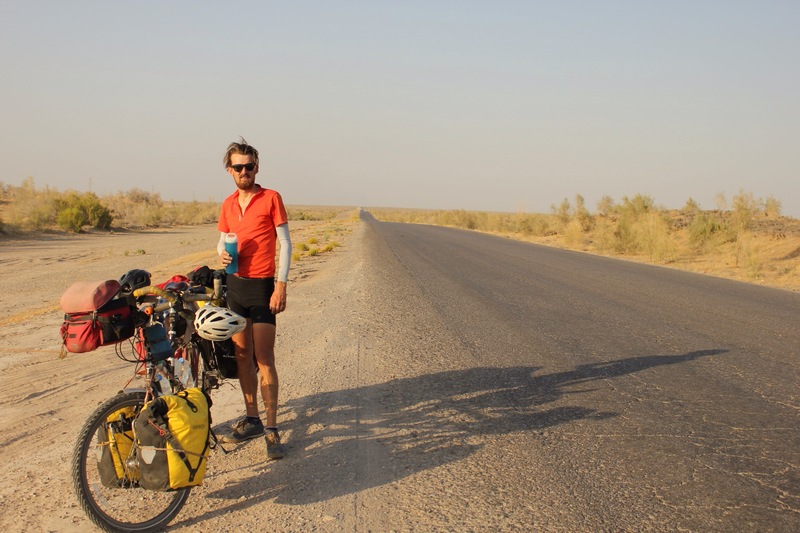 The cycle between the border and Osh was spectacular, and for me personally, its some of the most rewarding and nourishing countryside we’ve camped in. Stunning snowy mountain ranges which give way to the greenest, richest rolling hills you have ever seen. 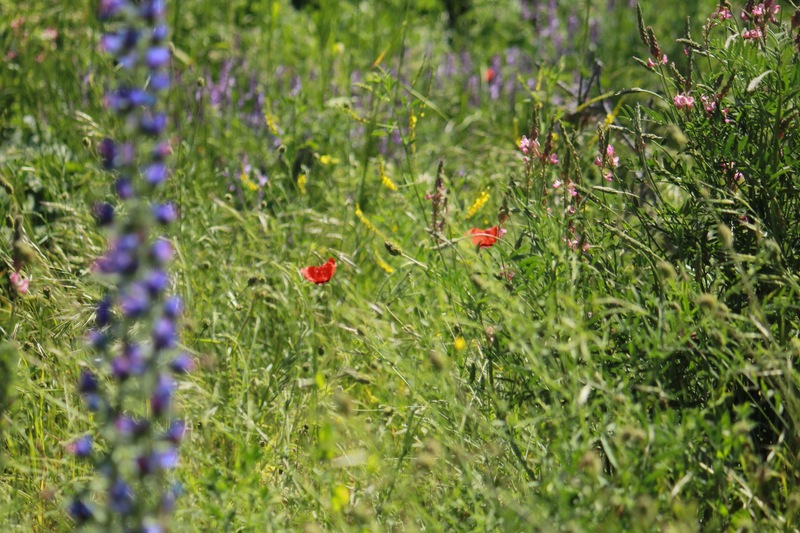 As we lose height, these, in turn, give way to sweeping meadows of long grass and hundreds of species of wild flowers. Some fields are literally stained bright red with wild poppies while others are home to a thick tapestry of yellow, pink and blue. 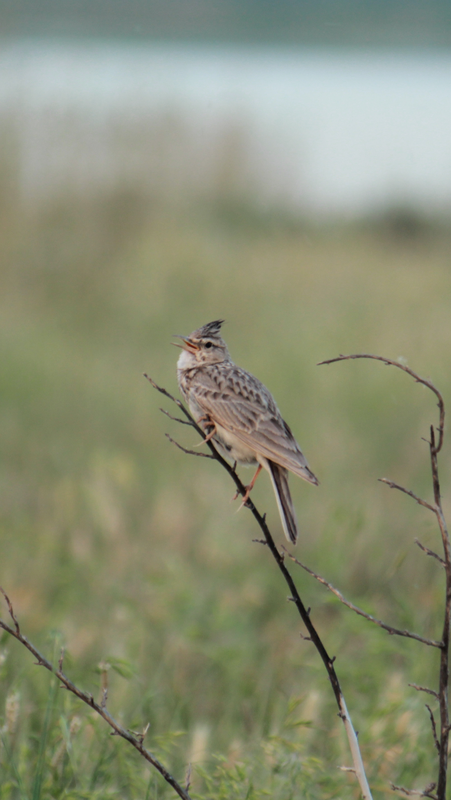 and this little lark who sat close, serenading us one evening. The vast lakes and clear streams have meant we’ve rarely had to buy water and we’ve enjoyed a shower and a sunbathe in the warm evening weather. 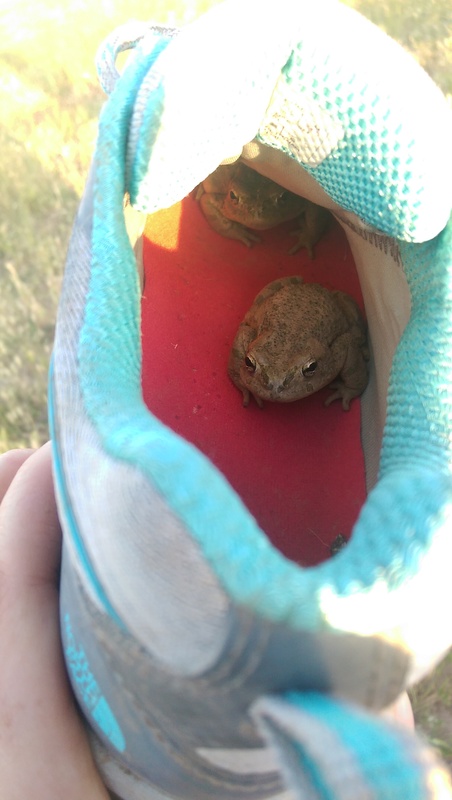 One morning I wake to find these two toady subjects making their own camp in my shoe! I contemplate keeping them as bicycle pets while one of them permits me to hold him for a while before hopping away. All in all its perfect camping weather! Onto this bucolic backdrop you pass collections of traditional yurts and caravans, momentous herds of cattle, groups of men harvesting hay by hand and children racing around on their pet donkeys. Having travelled to find new pastures for their herds, nomad families sit on large rugs in the shade of trees next to their open backed trucks which they will later unload. While stopping for our afternoon siesta (it’s too hot to cycle between 2-4.30) this travelling family of three generations invite us over for lentil soup and tea. Their old-school truck complete with sleeping grandmother in the back, excitable kids and practical mother figure reminded me of the Joad family in The Grapes of Wrath – the difference here of course is that they choose their travelling lifestyle. The most important lifeline for these people are of course their horses. 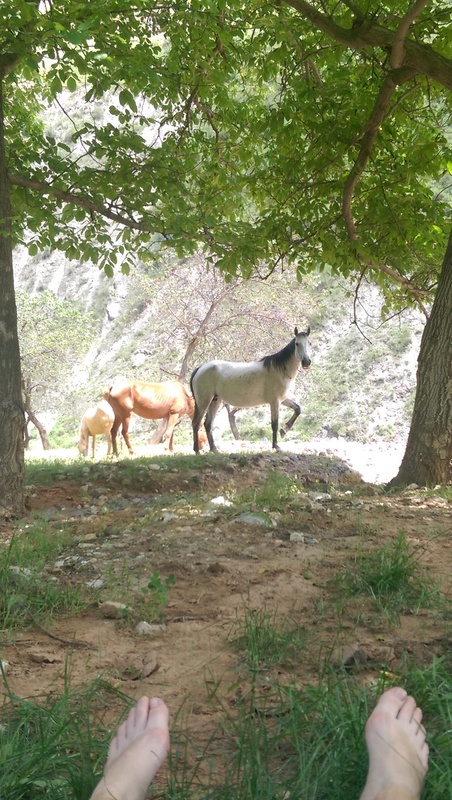 The Kyrgyz people are reportedly the best horesemen in the world and they have been breeding and domesticating horses here for well over 4000 years. 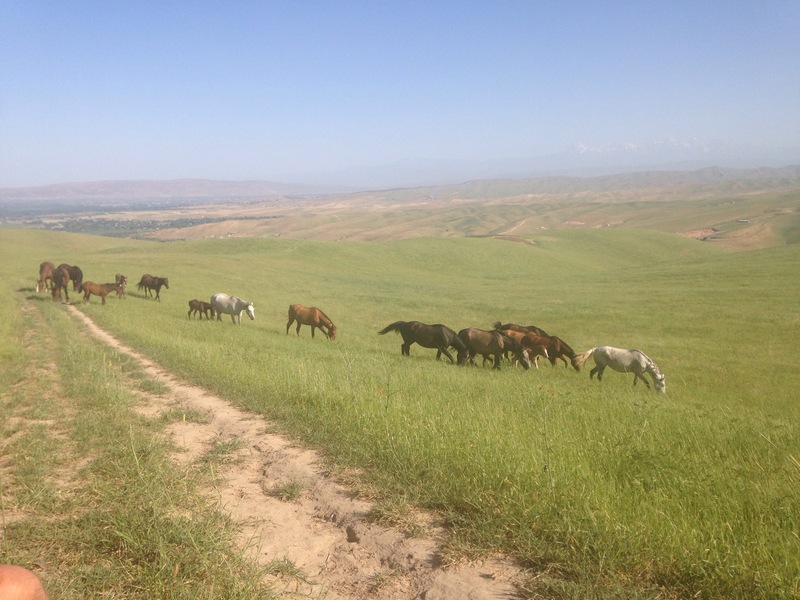 Kyrgyz horses are known for their speed and endurance and are also raised for their meat. They are big beasts averaging between 13.2-14.2 hands. It’s pretty magical seeing a huge herd of these beautiful creatures cantering across a field in front of you as you sit eating your breakfast. Being here in June has meant witnessing the start of the foaling season. Not only is it nice to see these bandy legged arrivals jumping about in the sunshine, it has also meant we have been able to witness the skilful talent that is mare milking. The people of Kyrgyzstan love drinking mare milk which they ferment to create a tangy, slightly alcoholic drink called Kumis. They also dry it into hard, Bon-Bon like sour snacks called kurut. Makeshift stalls are set up all along the road to sell both throughout the summer. 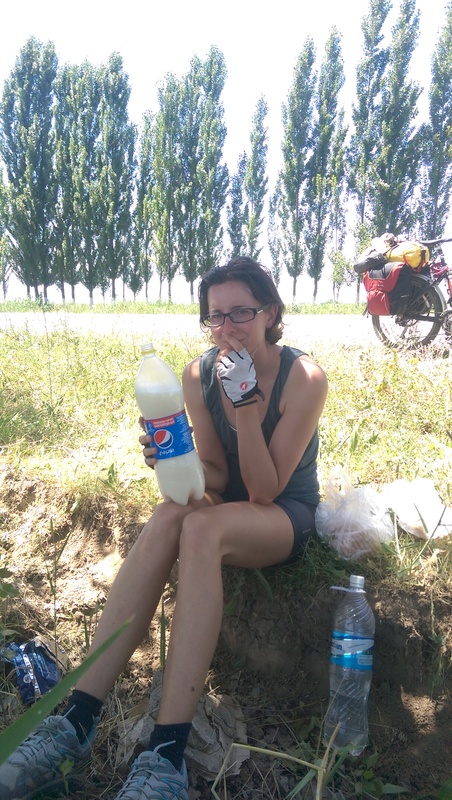 We were given a 2L bottle of kumis by a friendly lady who was waiting for a bus. Put it this way, it is an acquired taste and I’m not a fan!! Paddy drank quite a bit that evening but this was after the bottle had been sitting in the sun all day and he had a dodgy tummy the next morning. 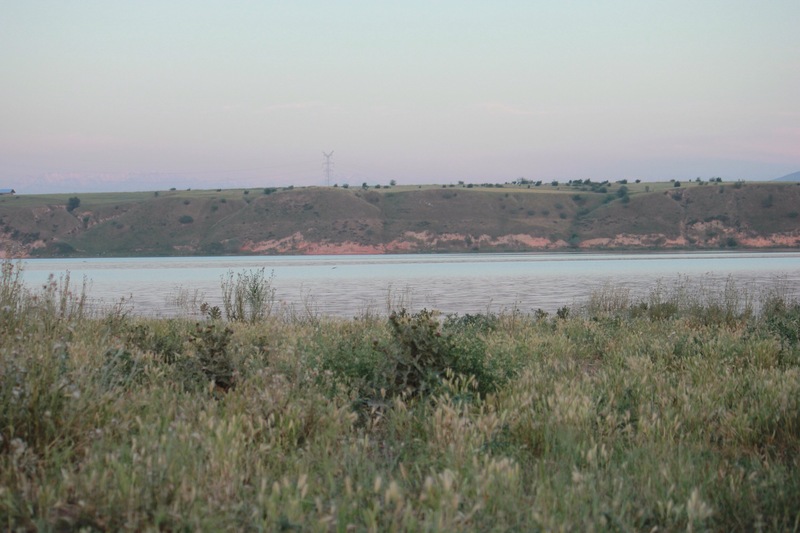 So our first week in Kyrgysztan has been a pastoral paradise really! The people in Kyrgyzstan are amazingly friendly and hospitable but they also respect your personal space and privacy. They are naturally interested in you but after coming to say hello, shaking your hand and asking where you are from they leave you to get sorted, calling their children away too so you are not gawped at while trying to change out of your sweaty cycling shorts or set up camp. This was a nice change from China, where the people are undoubtedly friendly and generous, but at times, a bit brazen! There was often a lot of staring, fiddling with the bike and routing through our bags without permission in China! You also get photographed A LOT in China (this really started to irritate Paddy after a while) but people here generally ask permission before they snap you which is a nice change. Many men still wear the traditional Kolpok tall woollen hat which is often decorated with black or brown embroidery. 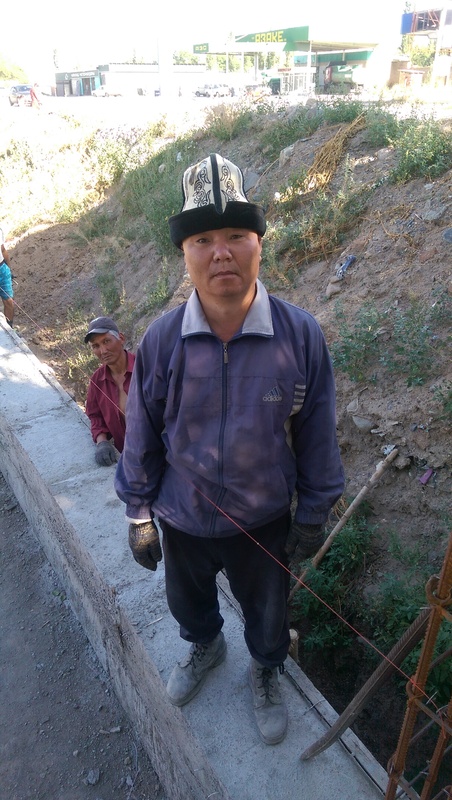 Even this builder was wearing one while laying a wall in the beating sun! The women here are beautiful and (in the South in any case) wear tied head scarfs and love wearing elaborately embroidered clothes. It’s very common to see both sexes sporting a few gold teeth. 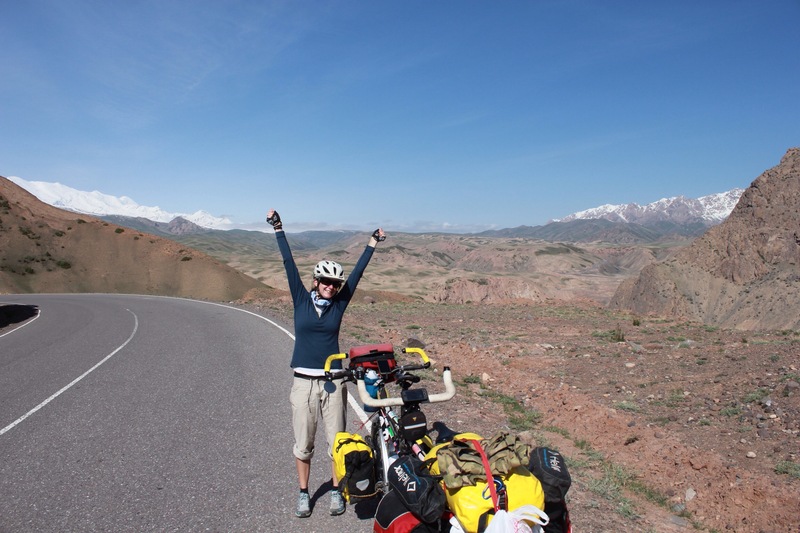 It took us 4 days to cycle to Osh. Here we will have a rest day before cycling north to Bishkek.